This lesson is more about tweaking the hardware on your guitar rather than your chops. By knowing how to do this it will save you form having to stop by the music shop and being guitar less while the work is being done. Additionally you will probably be saving $30 bucks or more. Heck if you get the hang of it maybe you can charge your buddies for setting up their axe. This is aimed at the standard Strat style guitar. This Lesson will show you how properly intonate your guitar. Intonation basically sets your guitar so that each note on each fret is in tune. There are some limitations because the frets are embedded in the guitar. What we are going to do to do a "Best Effort" to put your guitar in proper intonation. I would recommend doing this once a year or so and also if you drastically change string gages such as from 9's to 11's. To start things off lets take a look at the hardware were going to be working with. First off the Strat type of guitar has a floating bridge tremolo system. What that means is that part of the bridge is screwed into the body but behind the body are strings holding the bridge in place. This allows you to push the tremolo arm down to lower the pitch and pull it up to raise the pitch. A lot of other players have had problems with this kind of system. The flaws in this Tremolo system gave birth to the locking Tremolo such as the infamous Floyd Rose(r). The problem with the floating tremolo is that the guitar has trouble staying in tune. If all the strings are stretched properly and you wail on that bar, the guitar is out of tune. If the Tremolo is balanced correctly, all you should need to do is hit the bar once and the guitar should be in tune. 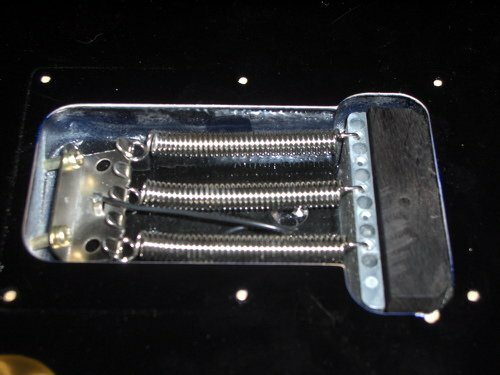 If you cannot configure your guitar tremolo, you can add another tension spring. 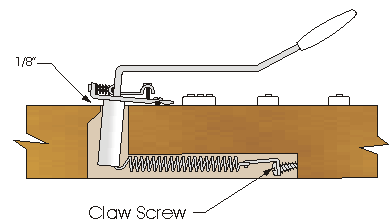 If you still cannot configure it correctly you can just tighten in the claw screws on the back to pull the bridge flush with the body. You can still use the tremolo to lower the pitch but it will not raise the pitch. The best way to check this is with a tuner on the octaves. For example play an open E on the 6th string, with a tuner make sure it's in tune, then move down to the 12th fret and play the E note still with the tuner. Is that E is tune or is it sharp or flat? If it's flat you will want to alter the the screw on the bridge for the string you need to adjust. I highly recommend, loosing the string first, then make a 1/4 turn and tune back up and check the intonation. Repeat until all your strings are intonation. Another aspect that is often over looked is action and height from the strings to the fretboard. By adjusting the saddle using an Allen wrench it will raise and lower the height of the saddle. An easy mistake is to lower the bridge too much and then you have a lot of feat buzzing. I recommend having the action high enough that there are no buzzing. You may have some areas that are problematic and the frets may need to be filed to remove the buzzing but this is left for professionals. As always your feed back is always appreciated and feel free to post a comment or PM me any questions. Good lesson. I'd suggest adding a bit on the truss rod and nut height and width. How do you perceive pulling the tremelo flat, with extra spring tension, will effect the intonation? Why do you suggest a setup each year? If the intonation is still good, why would you "fix" it? Thanks for posting! Everyone needs to learn how to work on their own guitar, unless you have a guitar tech on the payroll. This set up is very similiar to my guitar but not close enough i think to work for me. I could show photos of it but i can only submit comments here and not photos. I've had this lesson in my saves for a while i just never finished it. There is also an lesson on Gibson style guitars too. For a while there were a lot of forum questions about how to setup your guitar, lower action, whys my chord buzzing etc. This was an answer to that. It's not an end all but should give you enough information to feel somewhat confident in what your doing. Tinyskateboard, on the back cavity of the start you will find 2 screws in the 2nd picture it shows them as the claw screws. If you screw them in further, it will pull the bridge flat with the body. Guitars are made of wood, and wood bows, expands and shrinks with weather. You should not need to re-setup your guitar every year but checking yearly for intonation can't hurt. Nullnaught, send me some pictures of your guitar I'll see if i can help. my email is in my profile if you need it. "Tinyskateboard, on the back cavity of the start you will find 2 screws in the 2nd picture it shows them as the claw screws. If you screw them in further, it will pull the bridge flat with the body. I was wondering what this does to the intonation, flattens it or not? 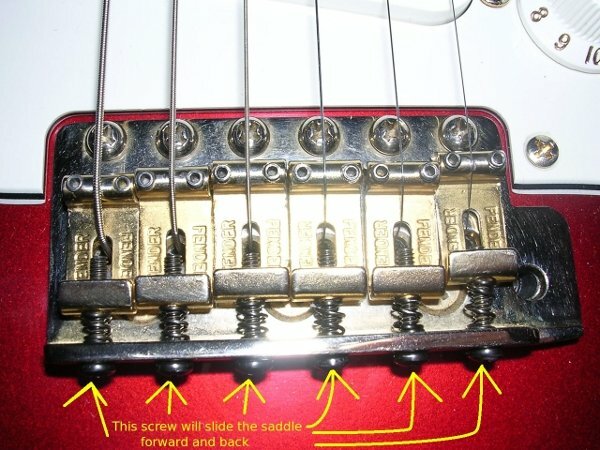 Incase you didn't know, Those two screws are not entirely intended to adjust the intonation. However, almost any adjustments of hardware on the guitar that touch the strings will affect the intonation. However, the intended intonation fine-tune is by adjusting the Saddles up towards the neck & down the guitar (NOT up, away from the bridge & down, towards the bridge). Screwing in the two screws you speak of (pulling the bridge flat) will sharpen the intonation because the string length is being elongated. (Think of when you use the trem. bar. Pulling the bridge away from the body drops pitch, pushing towards the body increases pitch).